Yeah, but: The One-Handed models are better. The Long Version: It's always nice when I read one of those "what knife should I carry" forum threads only to discover that I already own the tool that keeps being recommended over and over again. It's unlikely to happen, but there's no question that the Victorinox Trekker is what I would want to carry if I ever find myself in nature for any length of time. That's enough to make it September's SAK of the Month. The Victorinox Trekker – aka Trailmaster in places where Cold Steel doesn't have that name locked down – is a very serious SAK. 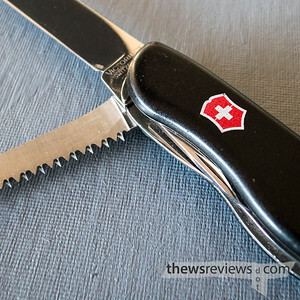 Notable for having a locking blade and nylon handles, there's also a one-handed opening version that's the basis for the contemporary knives for both the German and Swiss armies, and that model is worth a serious investigation for anyone who wants to never lose their tweezers or toothpick. As a 111mm knife, the Trekker is substantially larger and heavier than the 93mm Alox knives; to be completely honest, I find it far too large to carry for casual or occasional use. 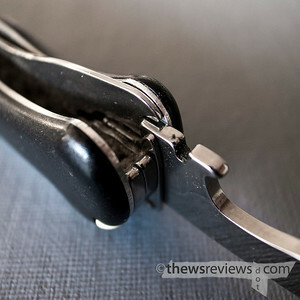 But that's not a problem for people who want a medium-to-hard-use tool, which the Trekker undoubtedly is. Both the blade and the cap lifter have liner-locking mechanisms to keep them in place, and both are considerably larger and heavier-duty than their smaller-SAK counterparts. Even the attachment point for the split ring is stronger than the usual, and could probably be a powerful striking tool in its own right. The Trekker also includes the extremely useful wood saw, which is my weapon of choice whenever I need to deal with wood or plastic, as well as the standard can opener, backside philips and awl, and it has the standard tweezers and toothpick in the handle. I'd combine it with a small pouch for belt carry, and just add a hatchet, tent, camp stove, food, water purifier, sleeping bag, cot, and a personal locator beacon for an excellent outdoors kit. My Trekker pre-dates the one-handed models, which is what I would buy now if I had to do it all over again. But this is one of those times when there's no bad choice, and these biggest Swiss Army Knives deserve a considerable amount of respect. I carried my one-hander trekker all this week. Interesting to find your review! I don't often carry it, though...I find it really easy to open with one hand. I like the lock blade feature. I'm not fond of the saw blade, but that's just me. I like the locking screw driver blade. Probably because I've cut myself badly with the sharp version of this blade on other SAK's. I don't carry it often because I miss the scissors on other knives. And I prefer the phillips blade to come straight out of the knife body, well, like a screwdriver. This one's a good knife. Incredibly sharp. 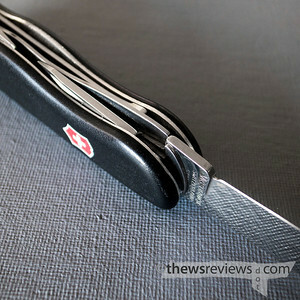 I like it better than the new 1 hander Swiss Army Knife, which I also have.